When exercising, perspiration is a good thing, but it can be a pain when your feet are too slippery to hold a triangle pose or you keep sliding down a wall during L-shape pose. When exercising, perspiration is a good thing, but it can be a pain when your feet are too slippery to hold a triangle pose or you keep sliding down a wall during L-shape pose. Instead of taking it easier, take your Yoga routine to the next level with Natural Fitness Grip Socks Made from premium Organic Cotton and featuring ergonomically-placed nonslip traction on the socks&apos; undersides, this special footwear provides extra grip to ensure you receive the maximum benefit from your workout. 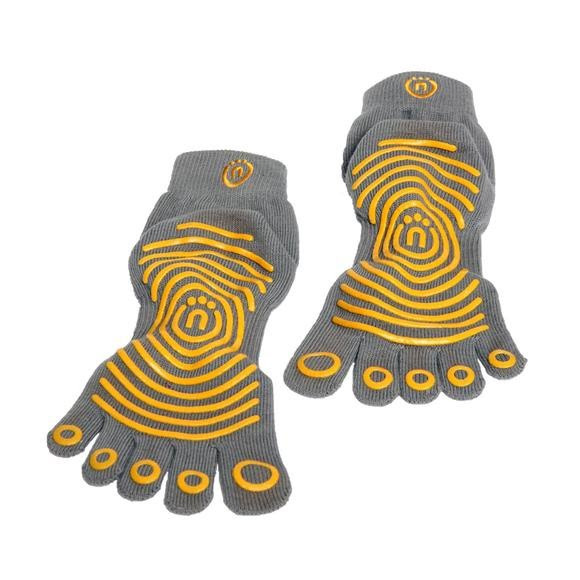 Available in two sizes for a great fit and featuring five-toe design to allow for a natural range of movement, these socks will make you feel that your intense workout is no sweat.